My basement is damp. Actually, when it rains these days (which is rarely, but the rains are usually strong and long), my basement floods. And sometimes it just floods even though it hasn’t rained. It’s also hot. After about 2:00pm, the basement workshop is too hot and humid to continue working. It’s time to stop when you find that condensation is forming on you rather than on the pipes overhead. 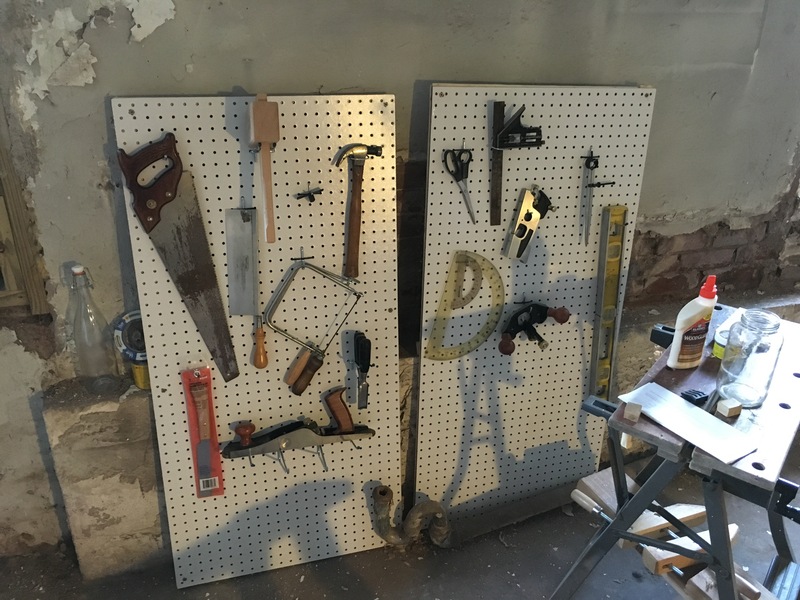 It was the condensation on those overhead pipes which got me started on this project — to build a pair of walls of pegboard to hang my growing tool collection on. You see, I have two small worktables in my basement, with one shelf out of the wet each — and not a lot of storage space above that. If you leave tools on the surface of these tables, or leave the power tools out of their plastic bag covers, they get dripped on. And then they rust. Rust and tools do not go well together. So I built two peg boards. It’s already clear that I am not going to stick around here for all that long, so I didn’t want to build hefty 2×4 construction designs for my tool racks. I wanted something simple, lightweight, and — let’s be honest here, abandonable — that kept my tools out of the worst of the damp, off the floor and out of the drip lines of the pipes. These two panels don’t hold all my tools. But they hold enough of my tools that I no longer need to pile things on top of one another. And they’ve freed up space in my Japanese Toolbox for the things that are particularly dust and damp sensitive. Progress is being made.